Comprehensive insurance coverage is one of the main coverages available as part of a car insurance policy. Comprehensive is optional insurance protection you can add to your basic car policy that provides you with coverage from damages that are not the result of a collision with another car. damage from weather conditions or natural disasters, like windstorm, hurricanes, tornadoes, earthquakes, hail, and flood. Comprehensive coverage also includes damage to a vehicle caused as a result of a collision or damage from birds or an animal. Is Comprehensive Coverage Mandatory or Required? Comprehensive coverage is not part of the state minimum requirement for automobile insurance. However, if you have a lease or loan on your vehicle, the lender or finance company may require you to purchase full coverage for your vehicle, in which case they will require that you include comprehensive coverage. If you lease or have a loan for your vehicle, you will be required to purchase comprehensive insurance coverage, even though it may not be a requirement by minimum car insurance state laws. The leasing or finance company will want to make sure your vehicle is fully insured while you still owe money on your vehicle. Anytime your car has value, you will want to consider adding comprehensive insurance coverage. Does an Old Car Need Comprehensive Car Insurance? damage from weather events like hail. These are very common causes of damage to cars that cost just as much to repair whether the car is new or old. Comprehensive coverage is usually sold with a deductible. You may usually choose the deductible, although the standard deductible for comprehensive coverages usually ranges from $100- $300. Depending on the value of your car, or the cost of your insurance, you may also choose a higher deductible as a strategy to lower insurance costs. This strategy is usually a good consideration if you have a high-risk car or a high valued car. Given that many people use the comprehensive coverage to repair or replace windshields, which do not cost a lot of money, you want to make sure you fully understand the implication of your deductible and that you can afford the cost of paying your deductible, or repairs that cost less than your deductible in the event of a claim. Glass damage is usually included in comprehensive coverage on an automobile policy and would be subject to the comprehensive coverage deductible. If your vehicle has minor damage to the glass and only requires a repair, some insurance companies do not require that you pay the deductible. In some states, the laws regulate the application of a deductible on a comprehensive glass claim that only requires a repair as opposed to a replacement. Florida, Kentucky, South Carolina mandate the repair by comprehensive insurance coverage without a deductible because they have found that driving with damaged windshields is dangerous, this is an advantage of comprehensive coverage in these states. This being said, most insurance companies will waive the deductible in the case of a glass repair, so it is worth calling your agent or representative to know your conditions. Some states, according to the Insurance Institute, may also offer endorsements for full glass coverage in addition to the comprehensive coverage, that allows the policyholder to opt for no deductible when there is a glass claim. 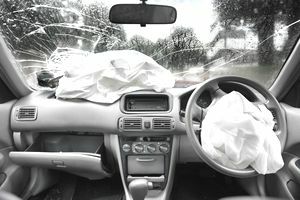 Do Comprehensive Coverage Car Claims Count as At-Fault or Responsible Accidents? Comprehensive coverage claims do not normally count as responsible accidents. Responsible accidents would fall under the liability or collision portion of your auto insurance and not the comprehensive coverage section. One confusing part of auto insurance comprehensive coverage which is unlike all the rest of the insured perils under comprehensive insurance is the coverage for hitting an animal. If you hit a groundhog, squirrel, moose or even hit a deer with your car, hitting an animal is covered by the comprehensive coverage of your auto policy. It is the rare occasion where you hit something while driving and it is not counted against you as a responsible accident. Most states and insurance companies will not consider this kind of claim a responsible accident. Contact your insurance company to find out how they view this and make sure that there would not be charges associated with a comprehensive claim. Rental reimbursement coverage only applies if you have it added to your policy as an endorsement. It is not included in comprehensive coverage. If you want to have a rental car while your vehicle is being repaired due to a comprehensive claim, then you need to make sure that you have comprehensive coverage on your car and rental reimbursement coverage or loss of use coverage. If you do not have comprehensive coverage, then the rental reimbursement coverage will not come into play because the damage isn't covered. Emily parked her car on the street outside a friend's building, during her visit the weather got bad, and she decided to stay the night instead of head home in the storm. The next morning when Emily went to leave she noticed the roof and hood of her car had huge welts in it. She figured it must have been caused by hail during the storm. She contacted her insurance company and they reassured her the loss would be taken care of by the comprehensive insurance coverage she selected when buying her policy although she would need to pay her $500 insurance deductible first. Mark was driving on the highway and all of a sudden a rock hit the windshield and created a crack. As soon as Mark got home, he called his insurance representative and was told that he didn't need to worry, he had comprehensive coverage which may help to repair or replace a broken or shattered windshield, he may only have to pay his deductible and the rest would be covered. Susan was driving home from Thanksgiving dinner at her family cottage when suddenly she hit a deer. Thankfully she was okay, but her car was destroyed. She called the police to make an accident report, then called her insurance worried that this might not be fully covered. Her insurance representative reassured her, she has comprehensive insurance, so the damage would be covered under her policy. Every Wonder How an Insurance Company Decides on Insuring You or Not? What Is an Insurance Endorsement or Rider and How Does It Work? What Is a Health Insurance Waiver and How Does It Work? What Is an A-Rated Insurance Company and Why Does It Matter? What is the Dental Insurance Waiting Period and How Does it Work?